Bridge Street Ski Haus is Vail's premier ski rental outfitter. Located right at Gondola One in Vail Colorado, customers are nearly on the mountain as soon as they walk out of the shop with their gear. In addition to their prime location, Bridge Street offers top-of-the-line demo skis and snowboard equipment, an upscale retail shop, and impeccable service. They are also partnered with CMH – a heli-skiing service in British Columbia. In 2015, Director of Vail Operations at Alterra Mountain Company,Chris Cremer contacted us after seeing some of the work we had completed for another client – Cutthroat Anglers. We completed several projects for Bridge Street Ski Haus, including a website redesign, onsite SEO, and graphic design for signage and print. Though each project differed in detail, they all shared the same end goal: to translate Bridge Street's brand of upscale recreation equipment rental into all of their marketing efforts. Bridge Street Ski Haus offers luxury and convenience – qualities not found in other Vail ski rental shops. Their concierge service includes cookies and coffee for guests to enjoy before and after hitting the slopes. Bridge Street is located at the base of Gondola One – putting skiers and snowboarders mere feet from the mountain. This sense of convenience, however, did not translate into Bridge Street’s previous online reservation system. Clunky and disorganized, the online reservation form required multiple pages to be filled out, resulting in a high bounce rate. So, we overhauled the entire reservation process. Our in-house designers and programmers turned Bridge Street’s online reservation form into a streamlined, easy-to-use, simple system. Now, customers can reserve their gear using one simple form. Their information is saved to a customer relations management system (CRM). This means that once a client fills out the credentials for their ski or snowboard gear, the information gets saved for future rentals. Since we integrated the new online reservation form, Bridge Street has experienced a dramatic increase in online reservations, essentially going from a handful in the 2014/2015 season, to over a thousand in 2016/2017, and are on track to double that in the current season. In order to properly convey a company’s brand image, their online presence needs to represent those values. Bridge Street Ski Haus’ previous website was cumbersome to use and had a high abandonment rate. Bridge Street really needed a way to draw in customers to not only rent gear, but to teach users more about what, and who, Bridge Street is. After several consultations, we were able to determine the perfect website layout and architecture for Bridge Street’s new site. Our professional designers blended a modern look and feel with an easy navigation for the optimal customer experience. After just four weeks, the new site was experiencing more hits, longer session times, and most importantly, more conversions. In order to get Bridge Street Ski Haus’ new and beautiful website in front of consumers, it needed a comprehensive SEO integration. In order to get the site performing well in search, we implemented a carefully researched set of keywords into the site – in both the content and meta data. By analyzing exactly what potential customers search for in the ski rental industry, we were able to pinpoint a list of specific words and phrases to utilize within the site. As a result, Bridge Street’s website is continuing to perform well in search results. We also created custom OGP data for each page on the site, for easy sharing on Facebook and other social media sites. 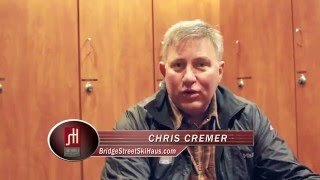 After giving Bridge Street Ski Haus a complete and total online makeover, Chris wanted to get word out on the street – literally. Our in-house designer created several large pricing posters to advertise the shop’s storage lockers, rentals, tuning, and equipment prices. We also designed a promotional poster for storage options to be placed outside the shop in Vail Village to educate customers on Bridge Street’s daytime and overnight storage choices. As with all our custom printing projects, we utilized the same branding template we used for the website, in order to maintain consistency (fonts, colors, layouts, etc.) and keep a consistent brand look and feel for their customers. We are proud to have Bridge Street Ski Haus as a client since 2015.